Open access science journal PLOS One is once again under scrutiny after a Creationist-minded research paper about the evolution of human hands got through peer review. Yikes. The word “creator” isn’t exactly the kind of thing you want to see in a scientific journal. Our study can improve the understanding of the human hand and confirm that the mechanical architecture is the proper design by the Creator for dexterous performance of numerous functions following the evolutionary remodeling of the ancestral hand for millions of years. So the authors are unabashedly claiming that The Creator, i.e. 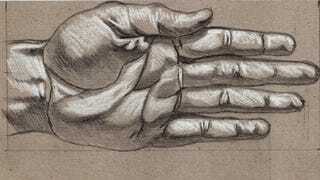 God, had an active role in the evolution of the human hand. It’s the classic Design Argument for the Existence of God cloaked in scientific jargon. And it’s not even really cloaked, which is part of the problem. The PLOS One reviewers either didn’t care or they didn’t bother to scrutinize the paper very closely. Regardless, it got through, and now the open source journal is dealing with the predictable shitstorm. The paper’s comments section is full of indignation and requests that the paper be removed, and it has inspired such hashtags as #Creatorgate and #HandofGod. Retraction Watch is reporting that it’s heard from one the editors listed on the paper, Renzhi Han from Ohio State University, who implies the language was a mistake: “I am sorry for this has happened. I am contacting PLoS one to see whether we can fix the issue.” Some commentators have come to the journal’s defense, saying that cultural and language differences are to blame. But given the explicitness of the statements in the paper, that’s hard to swallow. A number of readers have concerns about sentences in the article that make references to a ‘Creator’. The PLOS ONE editors apologize that this language was not addressed internally or by the Academic Editor during the evaluation of the manuscript. We are looking into the concerns raised about the article with priority and will take steps to correct the published record.